Aust. Ch. Roxbud Talk Of The Town ? "Gabby"
NZ. Ch. 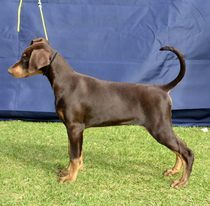 Masterkarn Echo of Pure Dance "Marley"
Clubs & Assoc: Dogs SA (SACA), United Pinscher club of Vic. Masterkarn Kennels is producing quality German Pinschers by introducing the top blood lines in the world known for stable temperament, good health and type into our breeding program. There are Masterkarn dogs behind the pedigrees of the most awarded GP's in the world dating back over 20 years of breed history- Dogs in the UK, Canada, USA, Europe, Australia and Asia. Our dogs are not only exceptional typey show dogs with great wins at shows in group and show level, they are wonderful family and performance companions epitomizing the sound structure, temperament and health we stride for and are proud of achieving by not only Masterkarn kennels owned dogs but owners of Masterkarn dogs. 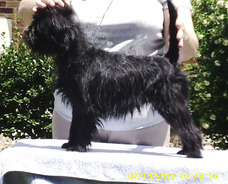 We are consistently on the show scene in Australia at dog shows around Adelaide and the outer suburbs. 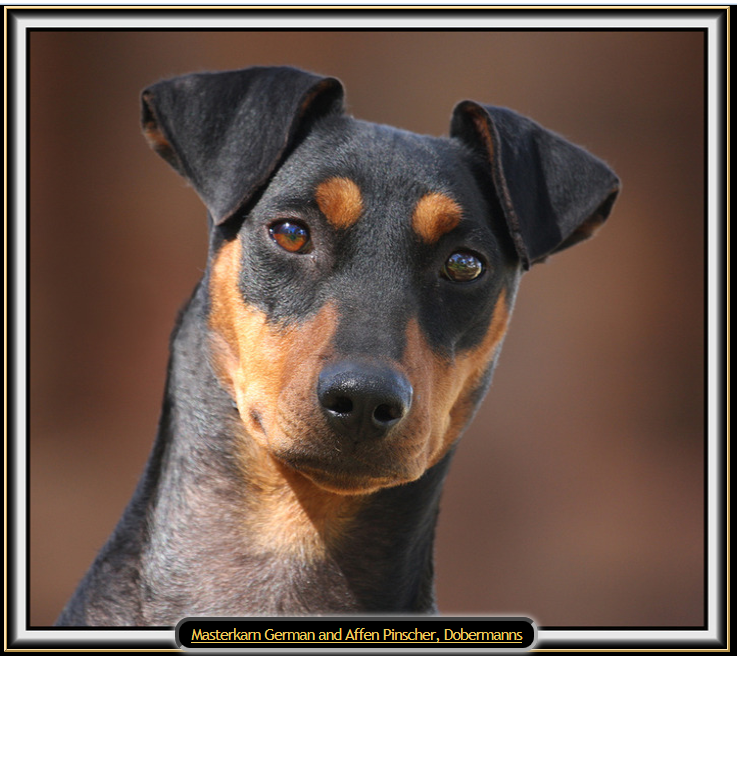 John and Anita formed Masterkarn kennels in 1984 (Dobermanns) and in 1989 introduced our first German Pinscher which became our dominate breed. John started obedience in 1975 with his German Shepherds he later became a trainer for DCSA in 1985 with his first Dobermann. He was Head Trainer for the DCSA in 1986. 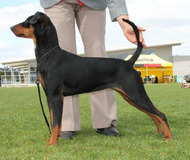 Anita trained her first obedience Dobermann 1979 then commenced training obedience classes in 1986 with the DCSA. Both became all breeds trainers in 1987. Dog Sport also became a part of our lives along with the show ring in 1984 with our first show Dobermann. Anita and John were heavily involved in the Working Aptitude testing in the early days with the DCSA and many of our Dobermanns were highly successful in the Working dog field, actual security environment and with consistently major wins in the show ring, WAC and top place wins in obedience trials. We have bred German Pinschers that have gained high obedience and agility training. Each of our dogs proved over and over again they were capable of performing in any or all of these fields. We are the only breed founder of German Pinschers in Australia still breeding consistently. Masterkarn and CelticMst kennels amalgamated in 2008 combining John's Belgian Shepherds and Anita's German Pinschers (main interest) and Dobes (now minor) breed interests. Our experience give us the multi-skilling to cope with more than one breed and focus on each as needs be. We don't get to shows as often as we would like but we are able to come up trumps when it counts. A thought to consider is...online competitions are not a true indicator of that breed or dogs competitive status. Quality is in that "LOOK" you see in a particular dog that exhibits breed type, that outstanding specimen that just grabs your attention AND meets the ideal of the breed standard. German Pinschers in a nutshell are curious, attentive dogs who are highly intelligent, loyal and affectionate hunting and guarding dogs. The other side of the coin is its personality as they are also tenacious, fearless, serious hunters and protective. Then they have its fun loving, clown of the dog world side to his personality. Therefore they can be quite a challenge and need very good socialising and training from a young ages. Thinking outside the box on the owner's part to guide all these characteristics in the right direction and develop a happy successful member of the family is necessary to have a happy dog and household. A combination of positive, treat and force training is usually the ideal for this breed, being able to outsmart them is the key. Summing up our Ethics - Peggy Adamson says it all - The real breeders are the heart and soul of the dog world. They stand proud and often alone, resisting commercialism, undeviating in their search for perfection and idealistic in their code of ethics. "Late Peggy Adamson, Damasyn Dobermann"
Masterkarn fully supports a full DNA breed profile testing for the French Bulldog. Health and Temperament is our priority. We would like to thank all our owners for their continued support in public & in all sports. Our companion puppies are sold on Limited registration with a de-sexing and health contract. Show dogs on main register only. If you like our breed type and feel comfortable with us, We "LOVE" to talk your ears off about our dogs so please do not hesitate to call us! Contact Dogs QLd for proof of membership.